A couple months ago I took on a more modest version of Bookshelf Battle’s self-imposed daily post challenge. Instead of a post every day for the rest of 2015, I committed to a post every weekday through the end of March. I’m a day away from completing it, having successfully avoided yetis, aliens, etc., and I’ve learned a lot. Daily posts have helped me build a back catalogue. Just a couple months in and I have a rich variety of useful posts for new readers to check out. It helped me see what’s occupying my attention. Turns out it’s mostly writing projects. (Surprise!) This is helping me get more self-aware and work to diversify what I think, talk, and blog about. I grew in discipline. The ability to write when you have nothing to write is a good skill for a professional writer. I learned again that there are always ideas if you’re willing to work for them. I started finding my voice. This is early, but the math-y, spiritual, geeky, whimsical, overthinky parts of me are starting to show through. My fiction deeply reflects who I am and I love it. I can’t wait until my blogging does so more fully as well. It clarified my goals. The habit of writing a monthly review and monthly goals has been surprisingly transformative. It’s crazy how much focus one blog post gave me. Mostly this is variants on “daily blogging takes too much of my writing-related time and energy.” Here are some specific angles. It’s incredibly time-consuming (for me). I can’t seem to stop at two sentences, which meant uninspired days became long slogs. This is also why I’m bad at Twitter, incidentally. Daily blog posts have a relatively low ROI. It’s been really useful having a blog in general. I’ve found some great people and—well, see above. But I think I would have gotten 80-90% of the value with 20-40% of the post frequency. This means misdirected word count. I’ve posted around 8,300 words on my blog this month. Some of that was reposted from elsewhere, so say I’ve written 7,000, but even so that’s more than a full week’s word count target. 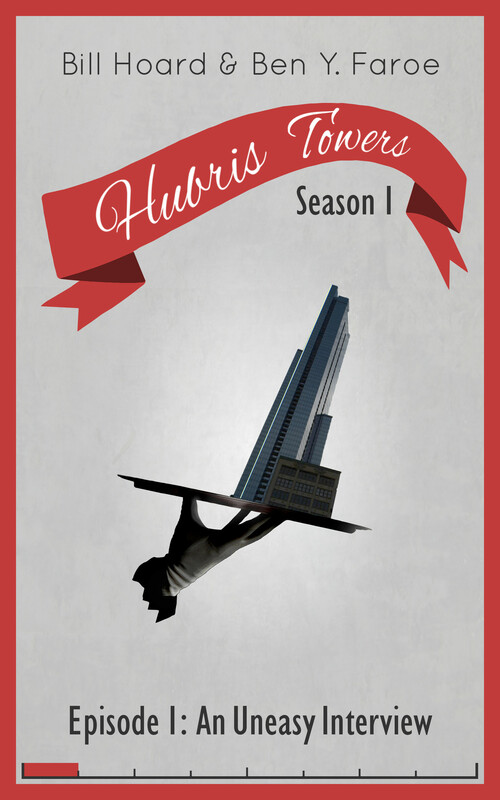 If that were Hubris Towers instead of blog posts, I’d be finishing up Episode 1 about now. The blog posts are worth it if I’m saying something worthwhile, but not if I’m just trying to fill space or meet my quota for the day. Blogging done my way has lots of peripheral time costs. It’s not like every 500 words on my blog is 500 words I didn’t add to a novel. While my composition speeds are comparable, I do a lot more editing and restructuring for non-fiction, and then I spend time on cool links and pictures and all. So really it could be that the opportunity cost of a 500-word blog post is 1,500 words on a story. And the stories are what I really love and am called to (and can sell, and what people might still be reading decades from now.) Kind of mind-boggling to realize I could maybe have written an extra 20,000-ish words this month. Maybe not—I mean, I also get distracted and dither and research and edit when I’m writing stories sometimes—but I’m curious to see how next month goes with lower blogging targets. Broadly speaking, I think it’s really clear that it’s worth having a blog and updating it regularly, and (given the particulars of my case), that it’s not worth posting to it every day. I’m proud of myself for following through on my challenge to myself, and I think it’s more worthwhile early on in the life of a blog just to skip over the sparse, navel-gazy, getting-your-bearings phase. But I’m not planning to stick with daily posts. Right now I’m leaning toward posting once or twice a week. This provides a bit of flexibility (to avoid wasting time when I have nothing to say) but also a bit of structure (because sometimes the good ideas don’t come until you sit and try for a while). It also maintains enough frequency to give you readers something worth coming back to with some regularity. I’m also looking forward to branching out a bit into other topics like worldbuilding, games and game design, productivity, the many splendors of Baltimore, communal living, Christianity and the invisible world, food, language, and fun tidbits and background about my stories and their settings, characters, etc. One question that’s still up in the air is whether I should pick regular days—say, Tuesdays and Fridays instead of just “two posts a week.” Could feel a little restrictive (though publishing as scheduled posts can help with that) but also sets up a dependable rhythm for readers. I’m probably going to go more freeform at least for April and see how that works out. But I’d love your thoughts. How frequently would you like to see me posting? Does it matter if it’s regularly on the same days? Any broad topics or specific subjects you’d like to see more (or less) of? I would *love* to blog daily, but I never seem to have enough mental ammo for it. As you said, I don’t think it’s a good ROI. I prefer to post at least once a week, preferably twice. My goal usually is 8-10 posts a month, 6 if it’s a bad month (aka tons of classwork or job demands). What I have noticed in terms of spiking interest is two blog posts about 2 or 3 days apart. If they’re a week apart or a day apart, the spike is minimal, if they’re within a few days of each other, I get a larger spike in views. Ooh, interesting. That’s really useful. Thanks! I concur with this post to the point where I could slap my name on it and it would also accurately reflect the results I’ve had as a once a day poster. It does lead to a great catalog – if I ever find time to organize it, I think it could lead to a lot of stuff for a reader to check out. One good thing about the catalog is more people find you through searching – maybe not today, or a month from now, but a year from now they’ll search a phrase that leads them to a post I wrote a year ago. It’s great practice, keeps my writing skills up, etc. I too am finding my voice – several voices actually i.e. recurring characters like Alien Jones and The Yeti (I’m fairly certain I’m the only one who finds them funny but oh well). It is time consuming and although I promised myself I’d just write something like “I like waffles” on busy days, I do end up writing a lot everyday. And to toss out a sinister motive – half the point of this blog is to build a platform to use to one day sell a novel. Yet, the little time I have goes to blogging and not writing the novel. Occasionally it starts to feel like an extra job. There is low Return on Investment though once in awhile I’ll hit something that causes a spike in hits. Oddly, you never know what people will and won’t like. IN CONCLUSION: It’s an uphill battle and the earlier you start the better. I believe in the “slow trickle theory” (yeah, that sounds dumb but oh well) in that overtime, this slow but steady influx of followers eventually leads to something. I have more followers this year than last year, will have more at the end of this year and my main regret now is that I didn’t try this like 5 years ago. Oh well. Look at me. I’m regretting not spending more time writing about yetis and aliens. Whodathunkit. Ooh, good point about people finding via search even over the long term. I hadn’t even thought about that. And I agree with the slow trickle theory. I kind of think of platform-building (and getting more books out) like compound interest. The more you can get out quickly, the better. The more you can have gotten out a long time ago, the even more better, though that’s not generally feasible. A saying I love comes to mind here: The best time to plant a tree is twenty years ago. The second best time is now.